"What should we do?" Priscilla asks as we arrive at the railway lines. She's nervous, but hiding it well. If I hadn't met them before, I wouldn't have suspected. But I have, so I know that her quiet demeanour is just a mask for her nerves at being in front of the camera. "Do what you always do," I tell them. "Be yourselves." And slowly, but surely, it happens. The nerves fade as Jacques takes her hand and they walk together, talking, laughing, and trying their best to forget that I'm there. Which is perfect for me - as I tell them, "I want to capture the way that you are when you're together." As their focus shifts from me to each other, I can see their poses adjust into comfortable familiarity. Priscilla smiles at first and then laughs at Jacques' jokes, and his soft voice is joined by a wide grin, which is echoed in her smile and her eyes. 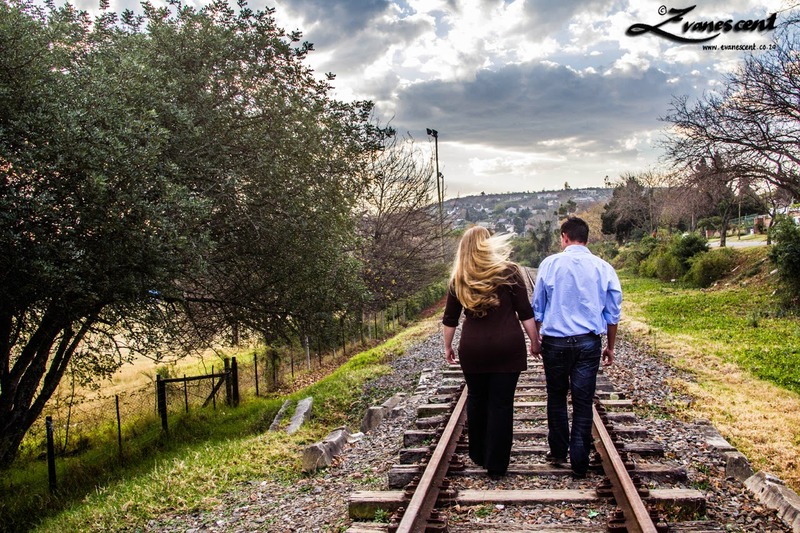 The railway lines that I've chosen to start off their engagement shoot are more than just a pretty backdrop - they're a part of their story, a symbol of the journey that led them to this point, and it hasn't been a short one. It's spanned George and Cape Town, and now Grahamstown, and it's just the start of their journey together. But, Grahamstown is a beautiful place to start a life together, and to show them that, I take them to my favourite part of town, just as the fog is rolling in. The two of them lean into each other as they sit in the long grass looking at the spectacular view of the town at sunset before it disappears into the all-encompassing fog. This is where they are for now, and who knows how long they'll stay, but just looking at them I know that wherever they are, as long as they're together, they'll be home.